"Mobil 1 Annual Protection is a pioneering product that will save our customers valuable time"
SPRING, Texas--(BUSINESS WIRE)--To meet the growing demand for motor oil that provides longer-lasting protection and performance, ExxonMobil is launching Mobil 1™ Annual Protection, which offers consumers the convenience of driving one full year or up to 20,000 miles between oil changes. Available in 0W-20, 5W-20 and 5W-30 viscosities and sold at retailers across the country, Mobil 1 Annual Protection uses the latest fully synthetic technology from ExxonMobil to offer guaranteed* engine protection for one full year. Mobil 1 Annual Protection has been specifically formulated to offer maximum wear protection, as well as increase resistance to oil breakdown and protect engine parts from harmful sludge and deposits, resulting in extended engine life. Engineers at ExxonMobil’s world-class technical center in Paulsboro, N.J., conducted extensive testing on Mobil 1 Annual Protection to ensure it could stand up to the most rigorous driving conditions. Over the course of a simulated six-year period, three vehicles – a Lexus NX 200t, Ford Fusion and Chevy Malibu – were each driven 120,000 miles, replicating extreme conditions, with the oil changed every 20,000 miles. At the end of the 120,000-mile test, the engineers dismantled the engines and found them to still be of brand new factory quality, including the bearings. The cylinder heads showed no visible signs of sludge, while the turbo chargers, one of the hottest parts of the engine, showed no signs of oil degradation or buildup. 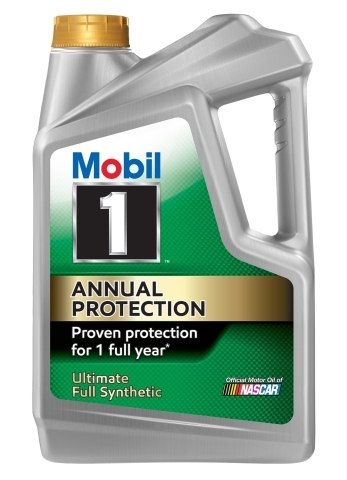 Mobil 1 Annual Protection is part of the high-performance, low-impact product line from ExxonMobil that provides both exceptional performance benefits and low environmental impact. By allowing drivers to go longer intervals between oil changes, Mobil 1 Annual Protection helps to safely reduce the amount of used oil generated through oil changes. In fact, if every passenger vehicle driver in the U.S. waited one full year between oil changes using Mobil 1 Annual Protection, it could reduce the amount of used oil waste by up to 587 million gallons. 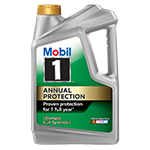 For more information about Mobil 1 Annual Protection, and to view videos from the testing process, go to www.mobiloil.com. *Mobil 1 Annual Protection oils provide guaranteed protection of critical engine parts for one year or 20,000 miles between oil changes, whichever comes first. The Mobil 1 Extended Performance oil filter is recommended for extended oil change intervals and meets the requirements of the Mobil 1 Annual Protection Limited Warranty. When extending oil change intervals beyond your car manufacturer’s recommendation, always use a high quality oil filter designed for your intended oil change interval. Read our Mobil 1 Annual Protection limited warranty for additional information. For more information, visit www.mobil1.com and on Facebook www.Facebook.com/mobil1.